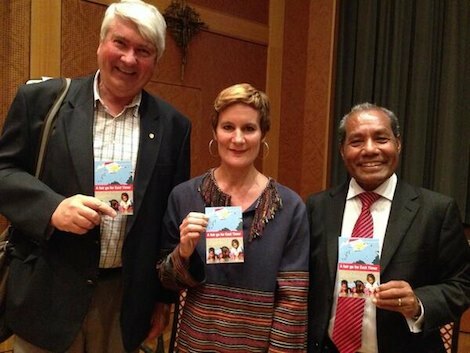 On Saturday, I had the pleasure of joining Timor Leste’s erstwhile First Lady Kirsty Sword Gusmao and the Timorese ambassador Abel Guterres (pictured) at a public meeting at the Mary MacKillop Centre in Sydney, convened by long time campaigners Sister Susan Connelly and Tom Clarke from the Timor Sea Justice Campaign. The message was simple: ‘A fair go for East Timor’. The lecture hall was full to capacity with Australians concerned about the decency of our dealings with the Timorese over the oil and gas reserves in the Timor Sea. In 2006, Australia and Timor Leste signed the Treaty on Certain Maritime Arrangements in the Timor Sea (CMATS). The treaty came into force early in 2007 with a provision requiring the submission and approval of an appropriate development plan for the Greater Sunrise oil and gas deposit within six years. The treaty was finalised at a time of considerable political instability in Timor. It was not subject to the usual treaty review processes by the Australian Parliament, there being bipartisan criticism of Alexander Downer’s wanton haste to grab a small window of opportunity for implementation of the treaty. In exchange for an increased share of the upstream revenue flow from any Sunrise development (increased from 18 per cent to 50 per cent), Timor agreed to Australia’s demand that we put boundary negotiations on hold for 50 years. Timor Leste already receives a steady revenue flow from the development of the Bayu Undan oil and gas field in the Timor Sea. With this revenue, Timor has the money to employ the very best international lawyers to advise on boundary delimitation. These lawyers think that Timor has a very strong case for establishing that the whole of Sunrise would fall within the Timor jurisdiction. Equally, Australia’s lawyers continue to argue Sunrise is located under the Australian continental shelf, and that even if there be agreement on a median line between Australia and Timor, there would be little prospect of Timor getting any more than 20 per cent of the upstream revenue flow. A year ago, the joint venturers for the Sunrise project submitted their development proposal for a floating natural gas facility (FLNG), avoiding the need to pipe the gas to either Darwin or Timor. The Timorese leadership are not interested in an FLNG proposal which would yield no significant downstream revenue, would contribute nothing to the development of infrastructure in Timor, and would do little to assist Timor employment and training. There is a political imperative for the Timorese leadership to be able to deliver to their people an oil and gas project which develops tangible onshore benefits, and not just another offshore revenue flow like Bayu Undan. Armed with evidence of Australian spying on the Timorese during the negotiation of CMATS, the Timorese decided to challenge the validity of CMATS, commencing an international arbitration. Australia then conducted raids on premises which housed material relevant to the arbitration. In view of the seizure of papers which clearly related to legal advice and preparation for the forthcoming arbitration from Timor-Leste’s lawyer, it is entirely understandable that Timor-Leste is concerned that there might be future interference and it sought an assurance from Australia that there would be no such interference. To my surprise, the undertaking from the Attorney-General makes no mention of this matter. In the absence of any undertaking not to interfere with Timor-Leste’s communications with its lawyers in the future, I accept that there is a real and imminent risk of such interference which requires action on the part of the Court. The day after the decision was delivered, the Australian stable of Murdoch newspapers carried the headline: ‘Australia wins East Timor UN court fight’. This was no win for Australia; it was a humiliating defeat. What is to be gained for Australia and Timor as neighbours airing dirty laundry in such exalted international fora? It is time for both countries to agree to put the unresolved boundary issue to bed. The situation is similar to neighbours agreeing not to settle the boundary of their back fence. That is all very fine unless and until there is a problem. Once there is a problem, it makes good sense to determine the boundary. The boundary should be left unresolved only if there can be the assurance that both parties can get what they want in the meantime, living amicably as neighbours. The Timorese want to find an economically feasible way in which Sunrise can be exploited with the gas being piped onshore to Timor for processing. Unless that can be done, Timor has no interest in the short term development of Sunrise. They think it is time to settle the boundaries. It’s time to pipe the gas to Timor or to draw the line and get back to being good neighbours. Frank Brennan SJ AO is professor of law at the Australian Catholic University and adjunct professor at the College of Law and the National Centre for Indigenous Studies, Australian National University. This article is extracted from Frank’s address at the Timor Sea Justice Campaign event on 17 May 2014.